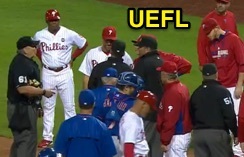 HP Umpire Bob Davidson ejected Mets P Hansel Robles and Manager Terry Collins for throwing at Phillies batter Cameron Rupp in the bottom of the 6th inning of the Mets-Phillies game. With one out and none on, Rupp took a 2-2 fastball from Robles for a called third ball. Replays indicate the pitch was located inside and head-high, resulting in a bench-clearing incident; warnings had previously been issued, the call was irrecusable. At the time of the ejection, the Mets were leading, 5-3. The Phillies ultimately won the contest, 7-5. These are Bob Davidson (61)'s third and fourth ejections of 2015. Bob Davidson now has 7 points in the UEFL Standings (3 Previous + 2*[2 MLB + 0 Irrecusable Call] = 7). Crew Chief Hunter Wendelstedt now has 12 points in Crew Division (10 Previous + 2 Irrecusable = 12). Relevant Ejection: E-179 Dan Bellino (3; Larry Bowa) [Hansel Robles Attempted Quick Pitch]. These are the 211th and 212th ejections of the 2015 MLB Regular Season. This is the 96th player ejection of 2015. Prior to ejection, Robles' line was 0.1 IP, ER. This is the 100th Manager ejection of 2015. This is the Mets' 6/7th ejection of 2015, 2nd in the NL East (WAS 8; NYM 7; PHI 5; ATL, MIA 4). This is Hansel Robles' first career MLB ejection. This is Terry Collins' 4th ejection of 2015, 1st since July 17 (Chad Fairchild; QOC = N [Balls/Strikes]). This is Bob Davidson's first ejection since July 2, 2015 (Yangervis Solarte; QOC = Y-C [Check Swing]).